I have such fond memories of Los Angeles’ Original Farmers Market from growing up. With its vast selection of food, meats, produce-It’s always been a great attraction to visit and whistling distance to the Miracle Mile. You can imagine my surprise when I moved back down to LA and discovered The Grove had moved in. Back when I was little, The Grove’s space housed a nursery and some antique shops. Since 2002, The Grove has been one of the most desirable and trendy plazas in the area. 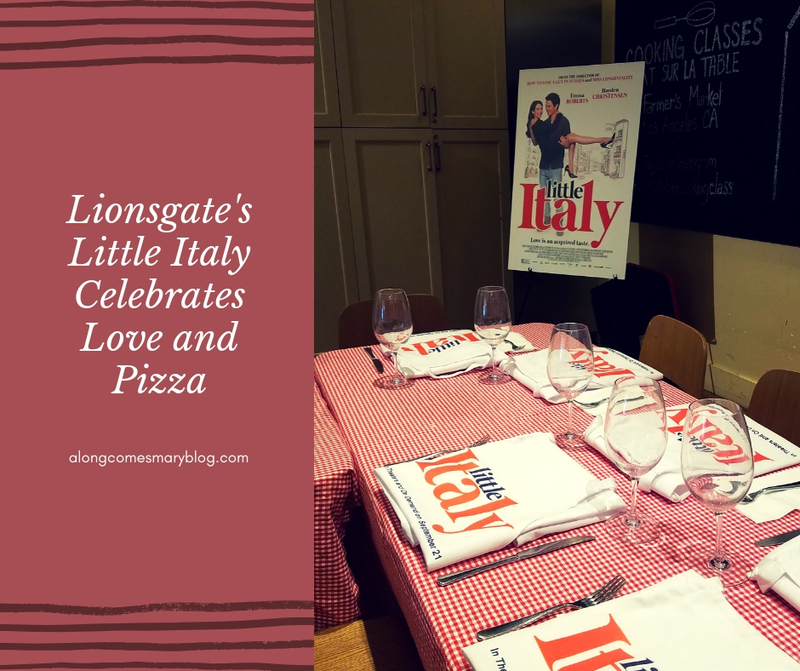 I was thrilled to head for a visit to the shopping mecca’s Sur La Table to celebrate the release of Lionsgate’s newest picture, Little Italy. 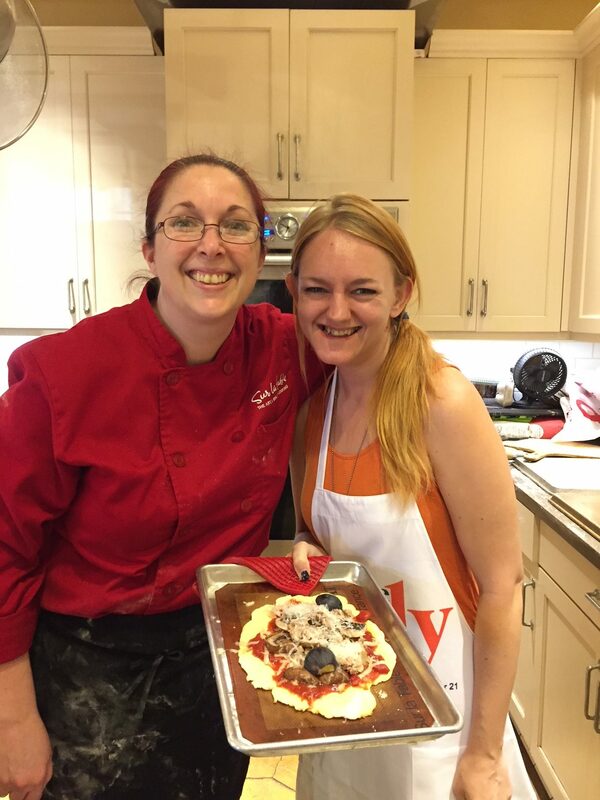 During our 2 hour class, our group tried their hands at making an early lunch of pizza and a Tuscan kale salad. We also had the honor of Little Italy’s director, Donald Petrie, in attendance. Read on to see how my creation turned out! Sur La Table is a spectacle for any aspiring chef or baker. If you don’t think you like to cook, you might want to rethink that after a visit. What makes Sur La Table so unique is the fact that they have a vast section of monthly classes ranging from cooking to cutlery courses. As we got settled and began our class, I was relieved to have the fabulous Chef Rochelle as our guide. Fun, blunt and at times channeling a bit of Gordon Ramsey, Chef Rochelle was an absolute sweetheart. She even confirmed with me that a gluten-free crust was at the ready for me and made sure to wash her hands anytime she came over to assist me with my pie. My takeaway at trying my hand at a gluten-free crust? To show the flour who’s boss! When Chef Rochelle plopped a ball of gluten-free dough in front of me, it was difficult to make it round. I found out that can actually be a good thing as that just means it’s a “rustic” pizza. A menu item that’s usually more money than a traditional pizza. Chef Rochelle and her staff had all of the goods we needed to make our masterpiece. Including smoked mushrooms which is a key ingredient in Little Italy, and even figs. While my pizza turned out good, I think we made a great salad. I love kale and continually attempt to add it more to my diet. With Chef Rochelle’s Tuscan kale salad, I learned some great tips for enhancing my own salads on those rare days I make one. One in particular I’ll be utilizing is covering a salad bowl in dressing BEFORE you add the ingredients. This way, it will spread more evenly. Why didn’t I think of that? I’m a sucker for a great romantic comedy. I’ve noticed they seem to be becoming more scarce. This is why I’m glad for directors like Donald Petrie. Petrie has made a career out of directing the great “rom-com”. Think no further than Mystic Pizza, How to Lose a Guy in 10 Days and Miss Congeniality. And, funny enough-Little Italy finds Petrie once again working with a Roberts and pizza. Little Italy stars Emma Roberts (niece of Julia) as Nikki and Hayden Christensen as Leo. Growing up as best friends, they were forced to part ways amidst their families on-going feud as pizza parlor rivals. When Nikki has to go home in order to get the documents needed for an overseas cooking school, she’s reunited with her childhood friend-and is forced to face her feelings for Leo. With a terrific ensemble cast that includes Alyssa Milano, Danny Aiello and Jane Seymour, Petrie has once again proven himself as a master of a lighthearted comedy. And, he wouldn’t want it any other way. As the director, whose father was Daniel Petrie, director of A Raisin in the Sun, explained-he worked the industry for years before trying his hand as a director. From serving as Sir Laurence Olivier’s driver to small acting roles, the aspring director found himself being offered many horror film projects. A genre that didn’t feel close to his heart. When Mystic Pizza happened, he knew he’d found his niche. If you’re in the mood for a fun rom-com, make sure you make some pizza, too! Little Italy is now in theatres nationwide as well as On Demand. It’s perfect for a girls night or curling up on your couch with some Italian food.